We have been taking advantage of the warm summer nights this week and trying to get out and do things outdoors. Owen is into distance running. After watching the events in the Olympics and watching Nadia and I run all the time, I guess it was inevitable. He is training for an 800 meter run at school. There is a nice 1.2 kilometer running trail in the Košutnjak Park. The trail is dirt/wood chips and lined with wooden beams. This park is the huge, former hunting grounds of the King, and is located just on the next ridge from Dedinje. The trail is marked ever 100 meters and they even have a 12 minute run test chart to see how your fitness rates. Besides the running track, there are tennis courts, volleyball, basketball, even a group was playing team handball on a specially marked court just for team handball. There were lots of people doing sport and exercising. The Serbs love sport! One of the nicest things about Belgrade is the idea of the “third place.” The third place is defined as the place that is not your home and not your work. In Belgrade, most people live in small apartments and so the public places (third places) are vibrant and full of activity and people. It is a refreshing change from the USA, where people have such nice homes that they don’t go out and mingle. With big back yards, lots of tech gadgets, Americans generally spend more time at home. 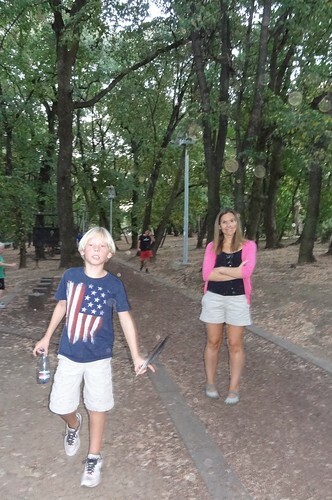 There is always something going on in Belgrade and the Košutnjak Park is a nice example. It is a great spot for families and I have some of my training running routes through the more remote sections. We have to do the fitness test soon!